It's Easter break - only 4 days here in Finland. Spring is finally here in the north, too, and the sun is inviting me out for a cycling trip to sniff and wonder at the first signs of colour around me after the endlessly long, white and grey, winter. 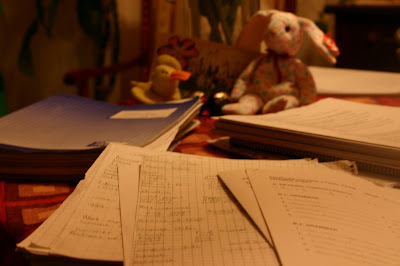 But since, as is my nature, I have left tackling the last exam week's papers till the last possible moment, my Easter is spent on what I have resentfully started to consider the necessary evil of my profession - marking exams. All these piles to go through - filled with the recurring 'Finglish' mistakes that my pen has underlined a million times during my career. Pheww, it's soul-destroying at times... It seems that, if a student doesn't learn the correct expression/word/structure straight away, the wrong (usually word-by-word translation from Finnish) expression gets 'fossilized' in their brain and is almost impossible to relearn later. This is one of the eternal questions of language learning/teaching - how to compromise the sometimes conflicting goals of correctness and fluency of communication. Too much nit-picky correction easily leads to students not having the courage to say much at all - at least with our Finnish mentality - whereas a certain degree of accuracy is undeniably essential to be a fluent communicator. Another conflict here is between school-type testing and real-life communication situations. Finns, in particular, are almost obsessed with teaching and learning grammar as a separate structure from authentic language use. Put a group of Finnish English teachers with a native speaker and you can bet it's not long before the talk turns into the details of grammatical rules with all the inherent metalanguage. So rather than discussing interesting current issues or getting to know the native speaker as a person, the talk invariably revolves around language correctness, reducing the poor native speaker into the role of a mere informant about his/her mother tongue. On countless occasions I have also witnessed my fellow language teachers revelling in spotting native speakers using their mother tongue incorrectly, proving that the foreign language teachers actually know better! Oh well, as much as I would like to, I can't escape my duties as a teacher in the system any longer - got to carry on ploughing through the piles in front of me.